My Small World: Jai Hind...!! 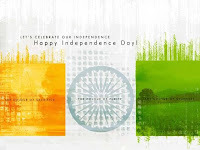 We are all set to celebrate our 63rd Independence day to commemorate of 62 Years of Independence. Be it Nuclear power or be it corruption... we top both the lists! Country men are becoming liberal day by day but the proportion of liberal thinkers to the total population is negligble!! On one hand we are advancing steadily on the technology side with new inventions and discoveries now and then. On the other hand, a host of unique ways of "corruption" being invented.... India is great...!! We need to wake up and stride forward to change the proportion of good to bad things... making good stand heavier on the bad... but how? I guess its just like preparing a cup of coffee for yourself... a cup of milk, a little sugar, a teaspoon coffee... and its ready...!! result... INDIA - the strongest, the steadiest and wealthiest economy and country of the world..!! Kolkata - city of joy? Kolkata - Ready for the change?